The study of cursive writing is not merely relegated to the tedium of copying specific letters. 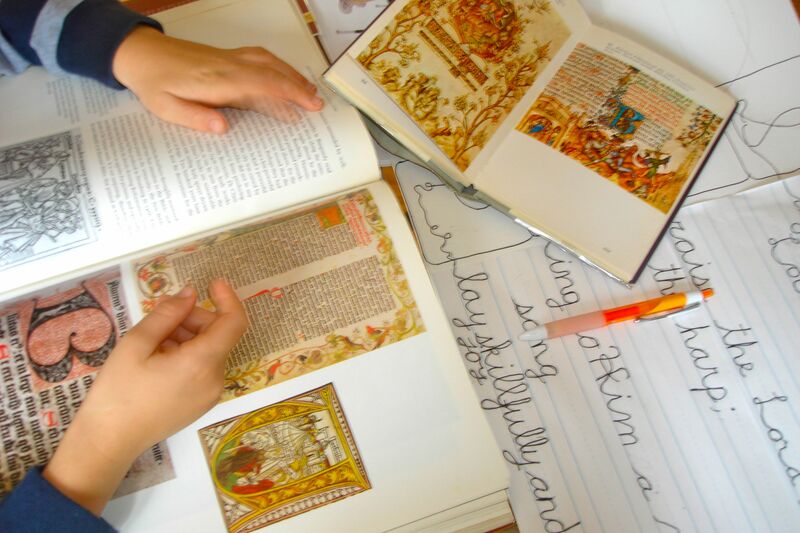 It is the ability to create beautiful manuscripts and illustrations in which words are as important as images. 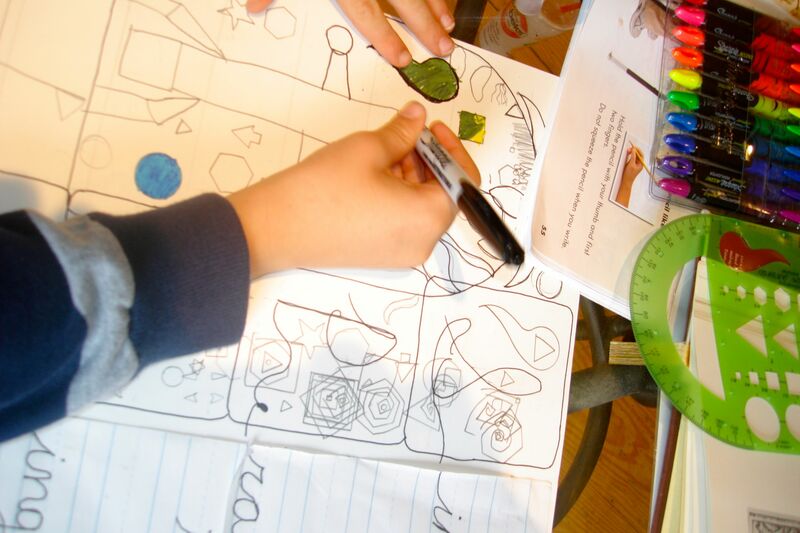 As with all our subjects, we began with the technique and then quickly segued into the role of cursive writing in history, art and religion. Bounce started his cursive career with our Zaner-Bloser Handwriting Book 2C. 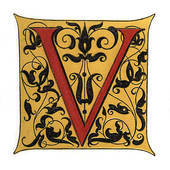 He copied the entire manuscript and cursive alphabets, both upper and lower case. He then had the opportunity to write and read a few simple sentences. He worked carefully and was off to a fine start. He concentrated. Some words were more legible than others, but all words unarguably wiggled across the page in a confident and loopy cursive. Eager to inspire Bounce with the beauty of writing, we began our study of cursive by looking at the root word, script, whose origin lies in the word scribe. A scribe is quite simply, one who writes. Before the advent of the printing press, and now publishing and the internet, there were scribes who perfected the art of copying. Writing was a true art, one which demanded both accuracy and beauty. Nowhere is beautiful writing more evident than in the illuminated manuscripts and Book of Hours of the Middle Ages. 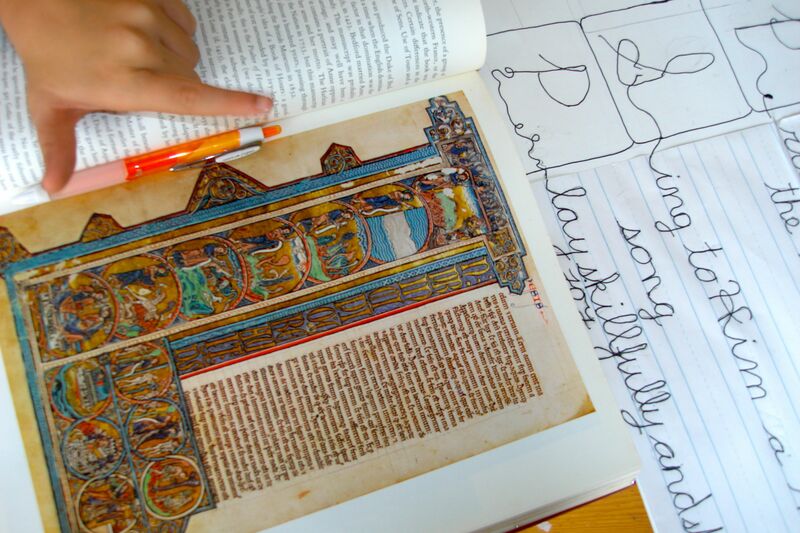 We studied these manuscripts and noticed several things. Bounce recognized immediately that the first letter of each page was enlarged and elaborately decorated. We also noticed that the colors were bright and beautiful. The designs were primarily geometric or inspired by nature emphasizing elaborate curves and swirls. 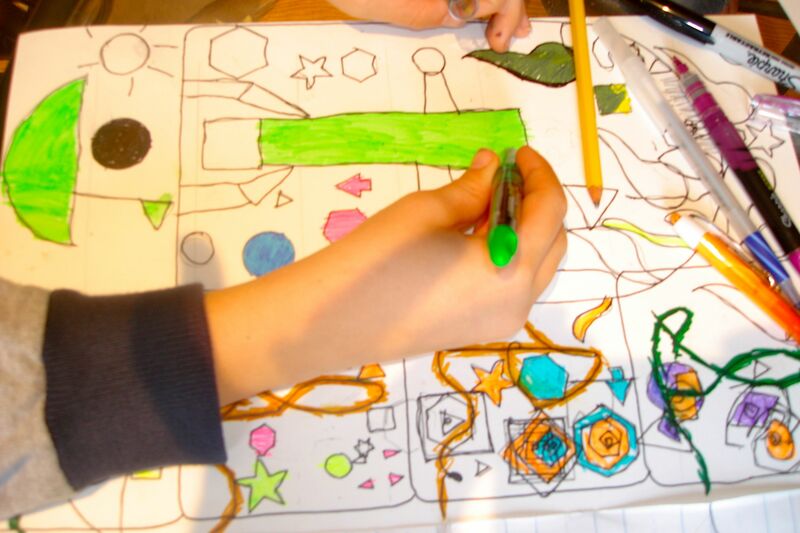 Our Happymess art, history and cursive project is to create our own illuminated manuscript page. 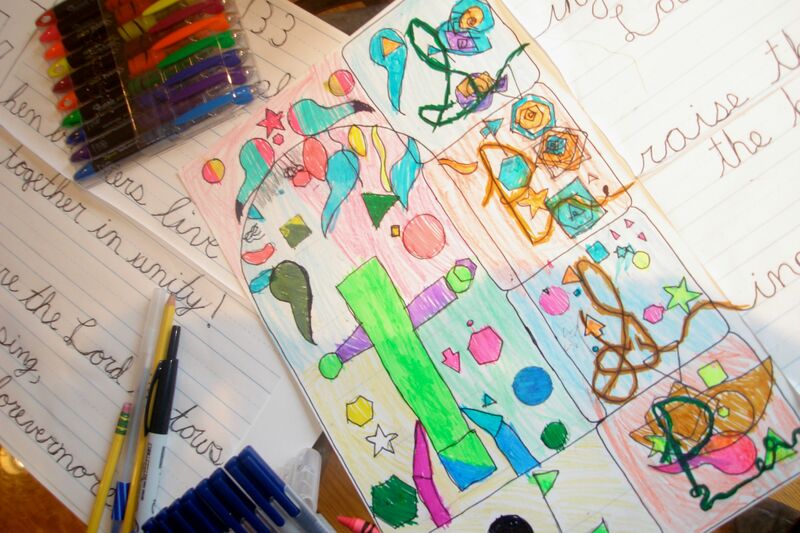 Bounce was excited about this project because he loves drawing and creating beautiful pictures. Handwriting Without Tears? We had no tears at all with this project. 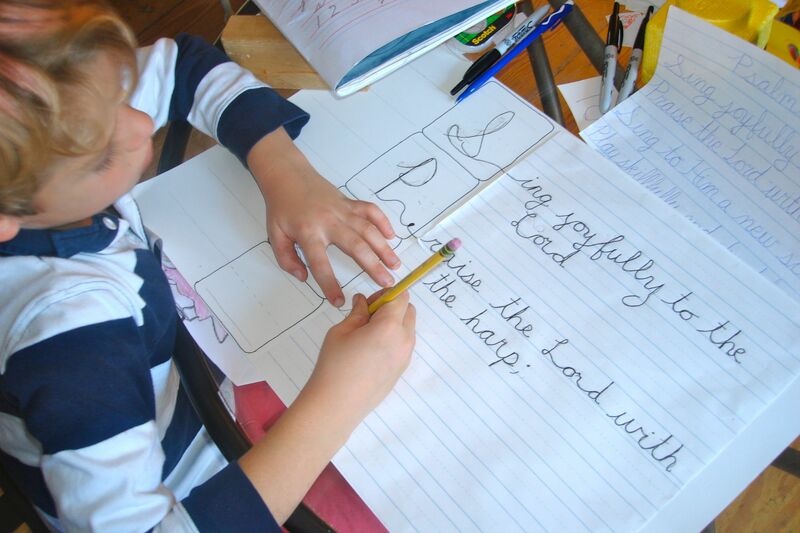 Bounce was motivated to write in cursive because he wanted to create his own Book of Hours. We chose a simple short verse, Psalm 33. We chose a psalm because we wanted to be historically accurate. 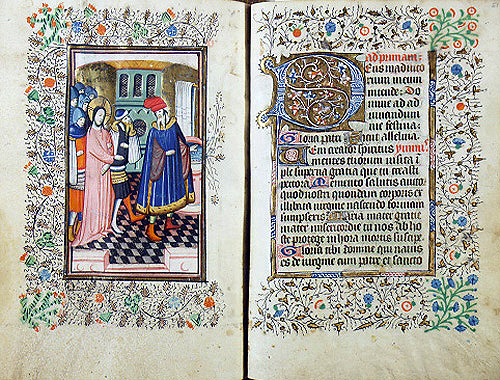 The Book of Hours was a personal book of prayer. I abbreviated the psalm so it was short enough for Bounce to copy, and emphasized points he could easily understand: singing, praising and playing. Bounce created a “page” which highlighted the first letter of each line so that he could also “illuminate”. In between each line of scripture (there’s that word root again), Bounce hopped on his bike and rode around the yard. 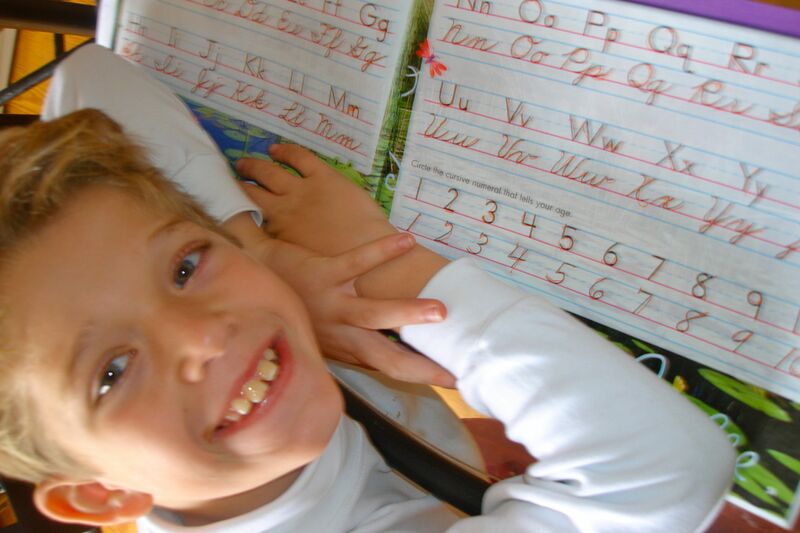 This gave him plenty of exercise while he was learning the art of cursive. Truth liked the look of the project and decided to make a page of his own. For Truth’s page we abbreviated Psalm 133 and chose lines that would have meaning for Truth. Truth decorated his page with an elaborate picture of brothers camping in the wilderness. He and Quantum will be camping together this weekend, so that seemed appropriate. Truth also read aloud several sections from our book on the history of the illuminated manuscript. We found that the majority of illuminated manuscripts were written between 1200 and 1450 (advent of the printing press). They were primarily created in the scriptoria of a monastery. 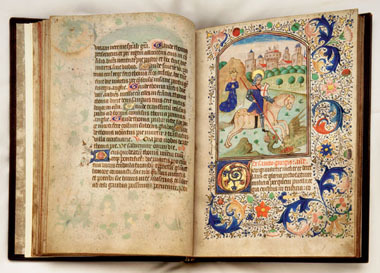 Most illuminated manuscripts were Bibles or personal prayer books, such as The Book Hours. Vocabulary for this lesson: Scriptoria, containing the word script, derived from the word scribe. A scriptoria (similar to cafeteria) is the place within a monastery where the writing takes place. Symmetry and symmetrical, designs with equally appearing elements presented in a balanced design. 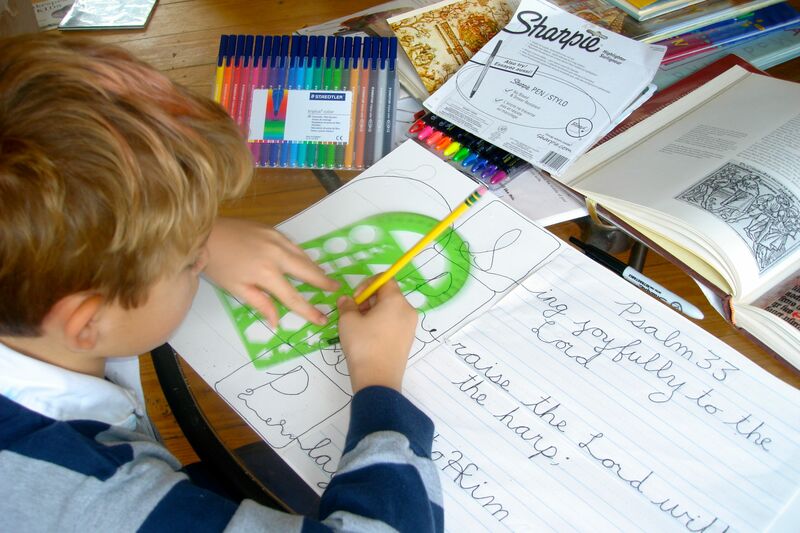 Let Me Count the Days: Homeschooling is teaching cursive as an art form, not a workbook exercise. I wish I had heard of this when I taught my oldest, almost 20 to write! Talk about tears. I didn’t fare much better with number 2, or 3. I still have two more children to teach cursive, so this is still a timely post. Thanks for sharing! A few years ago I organized a camp to create an illuminated manuscript of the Gospel According to Saint Luke and we did this in a week. It was a family camp in Michigan and the parents and grandparents wrote the text and the children and the parents decorated it. For the past 25 years I have been making by hand an illuminated manuscript of the Bible and you can see a video by the American Bible Society on my work at my website http://pepperbible.com/ along with other videos by CBS and the United Methodist Church. 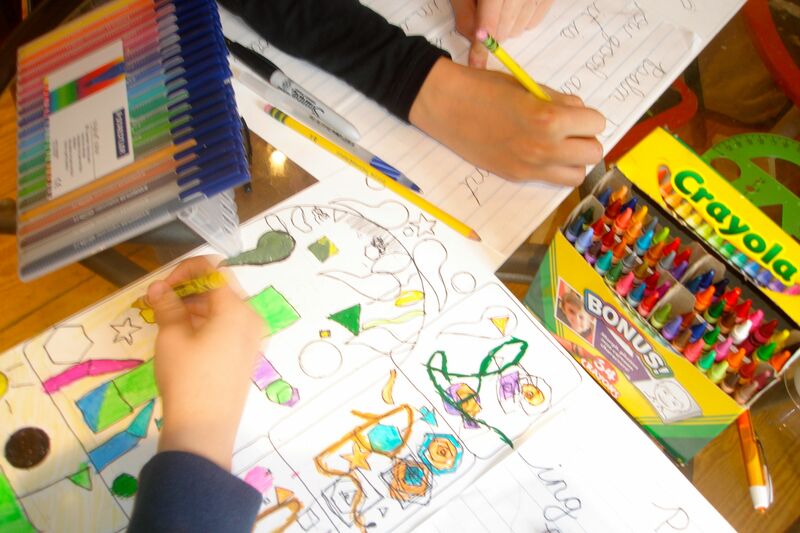 I highly encourage people to take up the pen and write and draw upon the page, Not only is it a lot of fun and a project you can do with your children, but it will be a keepsake lasting generations. Thank you so much for telling us about your website. I had no idea that there are still people today creating current illuminated manuscripts of the Bible. I love your work and look forward to sharing it with others, especially my children. This is truly a great project. Congratulations to you! That is so pretty. What a good idea. I know Bella’s will be beautiful. We had so much fun with this project. I know Bella will too.